Hard to believe it but Treasures of Oz 2019 marks the tenth year of our event. Even more amazing is that Ozaukee has even more places to discover than than we did ten years ago. Ten years ago OWLT had 12nature preserves in Ozaukee and Washington counties. At the end of 2018, that number had risen to 32. IN 2018 the Ozaukee Washington Land Trust has created two new preserves in Ozaukee County - so new they are not even up on their website, nor ours as of yet - but they will be. They are in the project area near Cedarburg Bog and are just beautiful. They will need volunteers to help with trail creation, so don’t hesitate to sign up for the STEW NEWS on the OWLT website. Right now you will need to call in to do that...ask for Josh. 262 338-1794. My opinion is that both sites will be really rewarding projects. Trail building is cool because you can see what you have done right away and then bring family and friends and show off the cool trail you just helped build. We are hoping one of these sites will be on the 2019 Eco-Tour. Ozaukee County has added 2 more parcels of land to their newest park. River Oaks County Park along the river in the Town of Grafton. The creation has come about through buying and restoring the land through a state flood grant and federal hazard mitigation programs. June 15th is going to be too early to showcase this little treasure, but when it is, we will get it on the website. As for our 2019 Eco-Tour - June 15th is the magic date - as always, the Saturday before Father’s Day. Besides cool treasure sites, there will be opportunity again to learn how to raise a Monarch from egg to adult butterfly at the Observatory's Monarch Workshop. Attendees who have a good supply of milkweed, the only plant Monarch caterpillars can eat, will be able to adopt Monarch caterpillars. Monarch experts will be on hand. Have you heard about the ArtServancy Project? This forward thinking project places area artists in a selected OWLT preserve with a mission to create a work that reflects the preserve. This is not just about painting but includes photography, sculpture and other media. Some of those artists well be present at our 2019 treasure sites on June 15th! You may discover them off and on during the year working away in their preserves. Maybe this will give you an idea because there is nothing like extended time in a natural place to change the way you look at the world and to stir your imagination. Speaking of art, there is another really BIG piece of artistic creation in another of our treasure sites for 2019. Can you guess? You may have seen it - it would be really hard to miss. Perhaps you or one of your children worked on it.It will be featured in June. The downside of being 10 is that we have sort of run out of newness in terms of getting grants for "new" things. A few of you were so kind as to send us a donation at the end of the year, and for that we are really thankful. We expect some of our sponsors will continue their support as well. Our largest expense for the event is advertising - but then, when we do the survey at the end of the event, most people report they heard about this through friends and family. So, you all have a mission this year - to keep spreading the word. The easiest way to get the word around is through social media - sharing our posts. That can make al the difference. Talk to your kids scout and 4-H groups as well. (4-H will be joining us at our treasure sites this year although the details are still in the works.) Remember to include your church groups and places where you work. We will be seeking volunteers again to greet and stamp at our treasure sites and help out with the auction. You will be able to sign up right here on the webpage. We have not yet finalized our sites, so wait a month or so and remember to check back. If you follow us on social media, you will get informations about signing up. While June comes up so quickly, sort of sneaks up on us like Christmas does each year, there are still good chunks of time to discover and enjoy other outdoor activities in Ozaukee. Keep a watch on our social media - we will try to get as many up there as possible - and watch our calendar on the website. Time: Things begins at 9:00 when all of the sites open. Sites stay open until 3:00 pm. Forest Beach Migratory Preserve stays open until 4:30 so you have time to turn in your passports for free raffle tickets and time to bid on our silent auction, listen to a little music, and have a bite to eat after all that touring. The seasonal feed of the underwater fish cam in Thienville in the Milwaukee River is live. Citizen-based monitoring of the video feed is an integral component of ongoing fish and wildlife monitoring efforts in Ozaukee County. Volunteer monitoring helps assess diversity of the local fish community, timing and duration of fish spawning runs, and presence of invasive species. 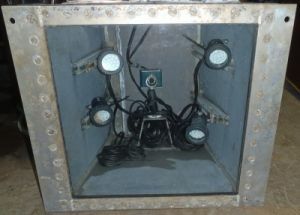 This unique monitoring opportunity is also available to individuals who may not be able to volunteer in the field. Join us on our 300+ mile journey as we walk this summer from the vibrant shores of Lake Michigan in Milwaukee to the coast of the largest (by surface area) freshwater resource on the planet, Lake Superior. The objective of the “Walk to Sustain Our Great Lakes” is to raise awareness for the Great Lakes and freshwater conservation. In spite of their majesty, the Great Lakes are a fragile ecosystem and face serious threats from pollution, invasive species, climate change, and degradation and loss of wetlands. The need for regulation, research, restoration and education on local, statewide and national levels is imperative now more than ever. We all have a stake in what happens to our natural resources; a stake in the future of these streams, rivers, lakes and Great Lakes. This is the last edition of my Portogram, due to my departure from this earth on September 4, 2016. It has been great fun, I’ve enjoyed it very much, and I send my best wishes to all my friends and followers. Michael Frome was born in New York City May 25, 1920, the son of William and Henrietta (nee Marks) Fromm. He changed the last name to Frome when he was nineteen. After high school he attended City College in New York. 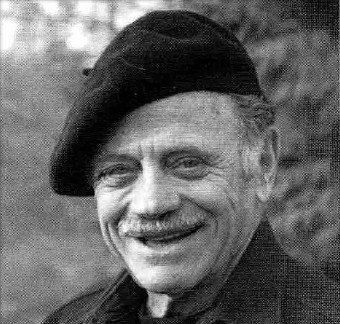 During World War II he trained as a navigator and served in the US Air Force Air Transport Command, flying to distant corners of the world. OWLT and Ozaukee County secured the ownership on Cedar Heights Gorge/ Ozaukee Clay Bluffs with its mile of Lake Michigan shoreline. It is destined to become a county park and be another showcase for our clay bluffs, which are unique to this area. The City of Port Washington, along with the cities of Sheboygan, Manitowoc and Two Rivers are well on their way to having their waters designated a NOAA National Marine Sanctuary focused on shipwrecks. OWLT preserved 185+ additional acres in Ozaukee County, including the new, 155 acre Spirit Lake Preserve in Mequon. This brings their total preserved acres in both Ozaukee and Washington counties to well over 6000. Ozaukee County Land and Water Management with Planning and Parks added a small park in the Town of Grafton on Edgewater Drive on the MIlwaukee River, adding to the necklace of beautiful stops along the river in Ozaukee County. This was the happy result of a flood control project. Ulao Creek restoration was completed at the Gateway site and mostly completed at the Arrowhead site. While these are not public places, this restoration is a huge addition to the health of Ozaukee waterways, fish and wildlife. Mole Creek restoration was completed south of Cedar Sauk Road. Like the Ulao project, this is on private lands but improves our waters. Both of these restorations are projects of the Milwaukee River Watershed Fish Passage Program, an arm of Ozaukee County Planning and Parks. The Friends of Harrington Beach State Park completed their accessible cabin project - a huge asset to the park and the county. It is now available for rentals. OWLT has improved the pool house structure and is in process of redoing the bridge at the Donges Bay Gorge Preserve. 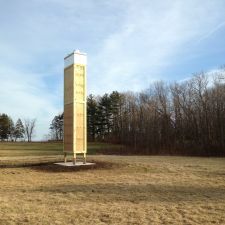 The first Chimney Swift Tower has been erected at Virmond Park by Ozaukee County Planning and Parks. With fewer chimneys and caps on those that are standing, the Chimney Swift population has been declining rapidly. Created structures (think really big bird house) are helping. The prairie and wetlands have been planted at the Krier Conservancy in the Town of Belgium, the newest nature preserve-to-be. It will be open to the public when completed. Future plans include a trail network with interpretive signage, bridges over Sucker Brook Creek, and several infrastructure improvements such as a nature center and pavilion. Thank you to these organizations and countless volunteers who are making Ozaukee a national model for a strong and healthy community that cherishes its environment.